There were some (very) big dogs. There were lots of (very) cute dogs. But after a hard-fought contest at the Zoom Room on Girard Avenue this past Sunday, there was only one official Philadelphia Water Spokesdog. Marking Storm Drains With TTF and Hackley School! Tookany/Tacony-Frankford Watershed Partnership, Inc. (TTF) is dedicated to enhancing the health and vitality of the TTF Watershed, including neighborhoods Philadelphia and Abington, Cheltenham, Jenkintown, Rockledge, and Springfield in Montgomery County. They work with residents, schools, community organizations, environmental advisory councils, businesses and policy makers to build watershed awareness. On Thursday October 3rd, TTF teamed up with 7th graders from Hackley School in Tarrytown, NY to mark 150 stormwater drains with stickers that say “No Dumping, Drains to River” to help raise awareness in the surrounding neighborhood about where litter goes when it enters the drain. In addition to marking drains, students picked up litter and leftflyers for residents, informing them about watersheds and combined sewer systems. Representatives from PWD also helped mark drains and brought an interactive model to demonstrate how combined sewers work. Students poured glittered water, representing waste water, into the model home and watched it travel down the pipe, get filtered and returned to the river. 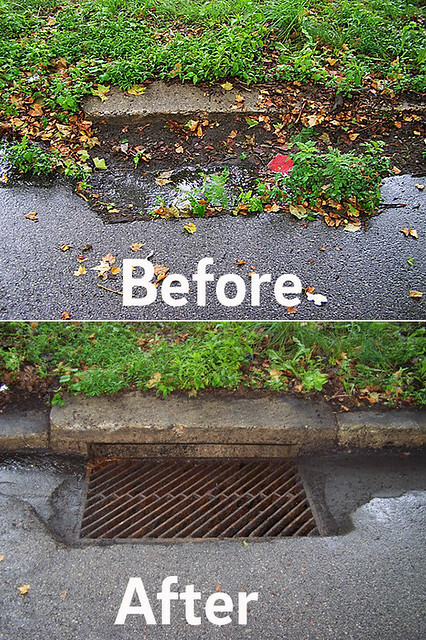 However, when they added rain to the streets at the same time as “using water” in the house, they learned that excess stormwater caused the system to overflow, sending diluted waste into the river. After all the fun, everyone wrapped up a day with pretzels and apple cider.